Check out the excellent rates for floating dock rental at Madison Barracks Marina. Docks are available for boats up to 50 feet in length. 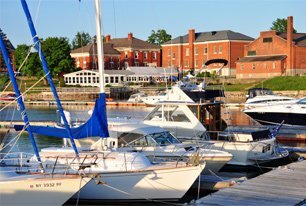 The Madison Barracks Marina is locally owned and has been in business for over 25 years. Wi-fi access available to dock, water and electrical hook-ups are available along with shower facilities. Contact Us Today to Rent Our Dock Space! Dock your boat in a protected harbor at Madison Barracks Marina. Our safe harbor has deep water and is close to amenities. Transient dockage is available. You can count on us for 24/7 service, and we are close to a large parking lot with FREE parking. Rent space for your boat today.